Oil on canvas, 98 x 78 cm. An older woman sits in a wooden armchair and gazes out at the viewer. She is dressed in a long, dark dress in the northern Italian style. Over her tight middle parting, she wears a headcloth and transparent veil. The face is unusual with thin lips and deep, round eye sockets. Her expression is serious and aware, but also gentle and alert. It is not just any woman who is portrayed here. 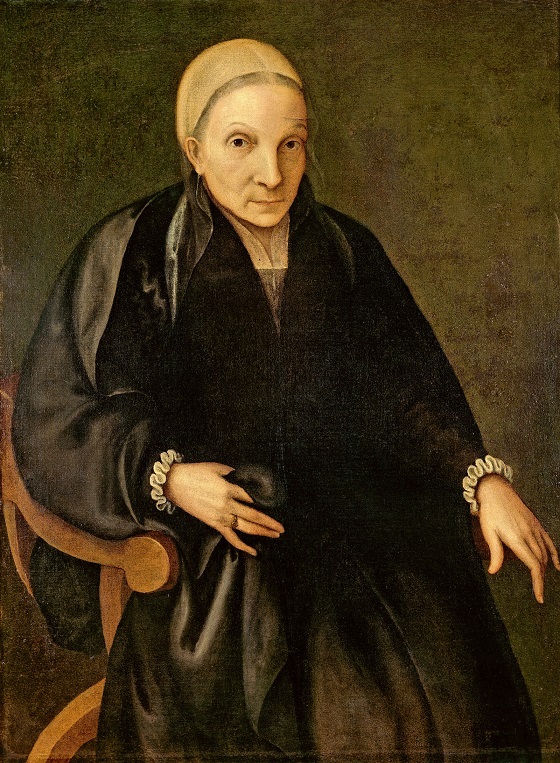 The painting has previously been considered a self-portrait by Sofonisba Anguissola, but was probably painted by an artist influenced by her. Sofonisba became a legend in her own time and had many imitators. The portrait is rich in painterly qualities and lovely details such as the depiction of the skin on her face, hands and lips, painted with fine brushes and extremely thin paint layers tinted with pink, blue and green. This colour combination, where the subtle shadows appear grey, provides a sensuous experience of the fine, parchment-thin skin.